I am of the Swistle camp, wherein new experiences make me anxious and I like to know exactly what to expect, or at least as exactly as is possible. First-person descriptions of experiences are invaluable to that. And I could find NONE online for the downtown Baton Rouge Fourth of July fireworks display. I even asked a few people I know who have lived in Baton Rouge for a while, and no one had actually been to this. Online there were a few vague ads for the event, which was sponsored by the USS Kidd, a museum/monument on the Mississippi River. 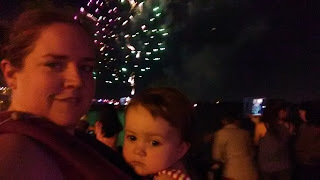 But they mostly focused on the daytime Independence Day activities, and I'm not interested in hauling kids to a full day of things AND staying up late for fireworks (plus the heat, my God, the heat). No information about parking and its cost, traffic plans, bathrooms. But last night we went anyway. Some people had parked tail-gate style, with their truck beds facing the river, in a lot just across River Road, the street that runs alongside the river. They could see the fireworks from their trucks and then more quickly get going to beat the crush of traffic after the show ... in theory at least. 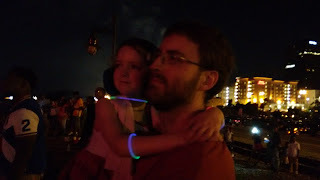 When we got downtown in advance of the fireworks display, plenty of people were on the levee, and some had definitely been there for a while. But it wasn't crowded really yet. We were able to get a spot on some grass on the non-river side of the levee's sidewalk, and we were a few blocks north of the USS Kidd where all the days' activities had been. Jane passed some time climbing down the sloped side of the levee toward the river -- it has big metal letters spelling out Baton Rouge. She did get her shoes completely muddy and gross, even though Shawn told her to stay away from the edge of the river, but that and some ant bites she got were the worst things, and neither was so bad. Livia was a little harder to control, since it was past bedtime and she likes to walk around but it wasn't really safe to let her do so, since the ground slopes on both sides of the sidewalk. It's a more gentle slope on the grassy side toward the road, but it's still a slope. The weather was pretty much perfect. It was hot, sure, but low 80s probably. There is humidity, yes, but it wasn't super oppressive. There was wind that kept things comfortable. I was expecting to be super hot, but I was much more comfortable than I was the night before at the Kenilworth Independence Day parade. So we were lucky in that aspect. Because we timed our coming and going (and because we were lucky I guess) we didn't need a bathroom, and that's a good thing. 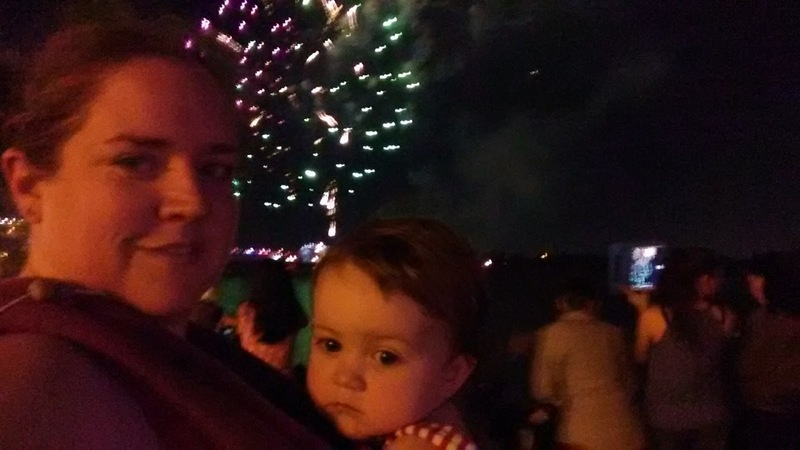 At the downtown Baton Rouge fireworks display THERE ARE NO BATHROOMS. According to the ads, you could pay $5 for a bathroom pass to the USS Kidd, which seems insane. There are a few restaurants and hotels that were open, and that's where police directed a woman who asked for a bathroom. (Their exact words were first "Good luck" while shrugging their shoulders.) It doesn't seem safe/right/legal to have a huge crowd without some sort of public bathroom facilities. But welcome to Louisiana I suppose. We took glow bracelets I had left over from Halloween and a light-up toy she got at Mardi Gras. I had bubbles in my pocket but forgot about them. There were people selling waters, and probably closer to the USS Kidd there were more food options. We ate supper at home and brought waters for the girls. There were no bag checks or food police, so having a picnic or snacks would have been fine I'm sure, although a little awkward in the proximity of the sidewalk. The show was good -- not as good as the DC or NYC shows we've seen in the past -- but still worth the trip. The girls liked it, although the booms scared Jane a little. We'd brought noise dampening headphones for both of them, but only Jane wore hers. Getting back to the car was fine -- I wore Livia and pushed Jane in the stroller while Shawn carried our blanket and stadium seats. (In retrospect, because we parked so close I would have brought the lawn chairs just for the wait -- standing during the show was fine.) We had to maneuver a bit through the crowd, but it was doable. Once in the car it took a while to exit our spot and then the parking lot. We went one way hoping to exit toward our house and avoid the interstate. We tried three different times and kept hitting road blocks with police funneling people toward the interstate. I get keeping people from coming into the congested area with contraflow, but why would you not let them out in every possible way?!?! Finally we got to Government Street and took that to Park to Perkins and home. It was about 10:20 when we got home, so about 40 minute travel home I think. Livia cried the second half of it, so that wasn't fun. We got the girls in bed. Jane slept late, but Liv was up at her usual time. She just had a good long nap though, so hopefully we can get back into a regular sleep pattern. I'd advise people without kids, or with kids who can stay up later, to just hang out downtown a little bit to let the traffic thin before heading out. TLDR; The downtown Baton Rouge fireworks display is worth the hassle. Parking is available -- for a cost. No bathrooms. Some food for purchase, but it seems fine to bring your own. Traffic is congested as expected after the show.